In many cases, you will find that you need to move things that are on your 3D layers in Photoshop CS4 Extended, either to compose your image, or to paint on the model. There are some real differences between the two kinds of movement. When you move the camera, you can see the model and its lighting from different angles. So, if there is a yellow backlight on the model, moving the camera can show your model lit primarily with that yellow light. Think of it as taking a camera in real life, and walking around the subject. It works exactly the same way. When you move the model, the lights stay in the same position relative to your point of view. So, if you have a yellow backlight, you'll never see it except on the edges of the model. It will remain in the back, no matter which part of the model is facing you. Think of it as setting a real camera on a tripod, and moving the object around, so different parts face the camera. That's what you're doing, but in virtual space, not real life. So, when you move the model, as you drag it up and down, it moves that direction in your viewport, of course. If you are using one of the movement tools, and want to toggle to one of the complimentary tools (Rotate and Roll, for instance, or Slide and Drag) hold down the Option key (alt on a PC.) That will toggle to the other tool for as long as you hold the key. Release it to return to the one you had. If you have more than one mesh in your model, you cannot move them independently. They will move as a unit, at all times. For more information, see the Accordion below. The 3D Axis has 3 color-coded arrows that point along the 3 axes; X, Y, and Z. These axes are relative to your model, not to the camera. So they allow you to move in what can be considered "local space." Each arrow has 3 parts, that turn yellow when you mouse over them. To Drag the model along an axis, mouse over the conical arrow point until it turns yellow; then click and drag. Movement will be constrained to the axis you have chosen. To Rotate the model around an axis, mouse over the arc section, below the tip, until you get a yellow circle. The circle shows the direction the model will rotate. Then click and drag, to rotate around that axis. As you drag, the circle will fill in, from the point where you started dragging to the current position of the axis arrow, as a visual representation of the degrees you've rotated. If you rotate more than 360°, the filled in arc gets brighter, so you can still judge rotation. To scale a model disproportionately, mouse over the block, below the arc, until it turns yellow. Then click and drag. Your model will squash and stretch along that axis only. To scale a model proportionally, mouse over the central, white cube, where all the axes arrows join, until it turns yellow. Then click and drag. Your model will scale equally along all 3 axes. You can also move along two axes at the same time using this widget. To do that, mouse over the intersection between two axes, just before the white central cube. When you are close, you'll see an orange flag appear, like a square that lies on the plane formed by the two axes. Mouse over it until it turns yellow. Then click and drag, to move the model freely anywhere on that plane. In addition, you can drag the entire widget by clicking the gray bar at the top, and dragging it around. You can put it anywhere in the window. If the arrows are too large, or too small, for your comfort, you can resize them by dragging on the scale button, on the right side of the gray bar. If the thing is in the way, but you want it handy, you can click on the Minimize button, on the left side of the gray bar. That will make it tiny, with no arrows, and put it in the top left corner of the window. However, it will still move, relative to your object, so it's still quite useful even minimized. To Restore it, simply click on the minimized version. Finally, you can hide it if you'd like. To do so, go to View > Show > 3D Axis, and click to disable it. Click again to show it if it's hidden, of course. This set of 3D movement tools allows you to manipulate the object (all the meshes on a single 3D layer.) You cannot move meshes individually in PS CS4; they all move as a single unit. These tools all move the mesh relative to the Camera; what would be called "Camera Space" in some 3D applications. 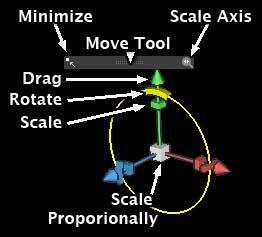 The 3D Rotate Tool allows you to rotate the object freely on all 3 axes. The 3D Roll Tool lets you rotate the object perpendicular to your point of view, so you can tilt it, or straighten it up if you don't want it to be tilted. These two tools are complimentary. To switch temporarily to one when you are using the other, hold down the Option key on a Mac, or the alt key on a PC. When you release the key, the tool will revert to the one you were using. 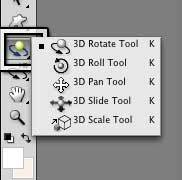 The 3D Pan Tool lets you move your object vertically and horizontally. The 3D slide tool lets you move towards or away from the view, and also from side to side. These, too, are complimentary. You can toggle between them as long as you hold the Option key on the Mac, or the Alt key on the PC. As soon as you release the key, you'll return to whichever one you were using. The 3D Scale Tool lets you scale your object proportionally, making it larger or smaller. This isn't an illusion; it's actually changing size. You won't notice the difference if you're only using one 3D layer; but if you start to combine 3D layers, you will. So you might find that it pays to develop good habits to start with, and not make the object larger unless that's really what you want to do. On the far left are the tool presets. This works exactly like all the other tool presets in Photoshop. Next to that is the Home button. If you lose your model somewhere, and can't find it in the view any more, clicking on this button will put it back where it was when you opened the document. So if you move the object, save the file as a .psd file, and reopen it, the position of the object when you open it that time will be the new Home, until you save and close. Next are the tools, exactly as discussed above, except arranged horizontally. Click on one to use it, of course. After that are the Position Presets. There are several of them here, and they can be very handy. They will all move your object into position relative to the time when you first imported the object, except for "Default" which acts pretty much the same as the Home button. If you have more than one 3D Layer in your document, those other layers will all be listed in the Presets menu. To move an object into the same position and orientation in space as the objects on a different layer, pick that layer's name from the Preset drop down menu. You can Save your own presets, or delete presets you have saved, using the next two buttons. Presets are saved with the 3D Layer, not with the document, or someplace on your drive. So, for instance, if you Save a Position as "My Fav Position" you will always be able to return there in that layer of that document. However, you won't see it in the menu of any other 3D layer in that document, nor will you find it in any other documents. If you combine two layers, you will lose any Custom Positions you have saved if they were in the layer on top (the one that is dropped down.) However, if they were in the one on the bottom, they will persist. So be aware of this when you're combining them. Finally, you'll see the coordinates fields. These will show the Orientation if you are using the Rotate or Roll tool, the Position with the Pan or Slide, and the Scale if you have the Scale tool active. You can enter numerical values in these fields to move, rotate or scale with precision. The camera movement tools let you move the viewpoint through which you see the 3D scene. The 3D Orbit tool lets you move all around the model, using all 3 axes. The 3D Roll View Tool lets you roll the view on the horizontal and vertical axes, so you can straighten it, or make it tilt from side to side (but not front and back. That takes the Orbit tool.) These two tools are complimentary. You can temporarily toggle from one to the other by holding down the Option key on the Mac, or the alt key on the PC. Releasing the key will return you to the tool you had. The 3D Pan View Tool lets you move your viewpoint horizontally and vertically within the frame. The 3D Walk View Tool lets you move towards your model, or away from it, as well as moving from side to side. These, too, are complimentary. Toggle between them temporarily by using the Option key on the Mac, or the alt key on the PC. When you release the key, you'll have the one you started with. 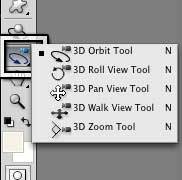 The 3D Zoom Tool allows you to change the zoom of the virtual camera. Unlike the Walk View tool, this will zoom straight into the center of the view, with no sideways motion. You are simply changing the degrees of the field of view, or the length of the virtual lens. You aren't really moving the camera in virtual space. When you have one of the Camera (View) tools active, the Options bar will change to show this set of Options. To the far left is the Preset drop down menu, just like all the preset drop downs for all the other tools in Photoshop. After that are the Camera View tools, exactly the same as the tool bar. Click on one to use it, of course. They are all explained above. Next are the Camera Presets. There is a list, for all the normal views (Top, Bottom, Right, Left, etc.) as well as "Default," which acts pretty much like the "Home" button. If you have more than one 3D layer, the other layers will be listed in this menu by name. To use a camera position from one layer in a different one, simply choose the name of the layer you'd like to use from the Camera Presets drop down menu. You can save your own Presets, or delete the ones you have saved, with the next two buttons. Once again, they are only saved with the layer that is selected at the time you save them. They will not be available from any other 3D layer in that document, or from any other document. What happens next depends on which tool you are using. If you are using the Orbit or Roll View tools, you'll get a set of coordinates that show you the camera orientation in degrees. If you're using the Pan View or Walk View tools, you'll get Camera Position coordinates. You can enter numbers in these fields, or drag on the axis name to change the values. If you are using the 3D Zoom tool, it's all very different. First, you'll have two buttons that let you choose a Standard or Orthographic view of the scene. For more about that, see below. If you're using an Orthographic view, that field will change so that you can chose the scale you would prefer. For instance, 1/1, 1/1.5, 1/3 etc. So, you may ask, what's the difference between a Standard View, and an Orthographic View? In a word, perspective. The Standard View has the perspective you would expect to see in the Real World. How much it has depends on the length of the virtual lens; but there is always some. So, in this image, you can see that the cube is behind the cup, but since there is no ground plane, you can't really get any idea of how far behind it is, or how large the two objects are in relation to each other. The cube might be tiny, and floating in space right behind the cup, for all we can tell. The Orthographic View has no perspective. So, not only do both objects look oddly flat, without the perspective distortions that we are used to, but you can see what the true proportions of everything in the scene really are. You can see that the cube is actually quite a bit larger than the cup, for instance. We can also see the true proportions of the cup itself; what size the rim really is in relation to the base, and so on. So, you would use Standard view when you're making an image to output as a picture. 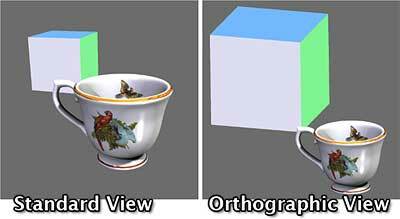 You would use Orthographic view to see the true size and proportion of your objects.